Since the passage of the Canada Health Act in 1984 and its prohibition of extra-billing, there has been an extremely limited role for private health insurance in Canada as a mechanism to pay for medically necessary physician or hospital services (Deber 2003; Detsky and Naylor 2003; Flood and Archibald 2001; Naylor 1999). In the aftermath of the landmark Supreme Court decision Chaoulli v. Québec (Chaoulli v. Québec [Attorney General] 2005), this may change. In Chaoulli, the Supreme Court narrowly struck down provisions under Quebec law that prohibited the purchase of private health insurance for government-insured physician and hospital services (Dickens 2005). In the context of unreasonably long waiting lists, four of seven judges agreed that the ban on private insurance was unjustifiable given the rights afforded residents of Quebec by the provincial Charter of Human Rights and Freedoms. The Quebec government was granted a one-year stay of the Supreme Court ruling in order to consider its options. After a lengthy internal review, the provincial government published a consultation document in February 2006 titled Guaranteeing Access: Meeting the Challenges of Equity, Efficiency and Quality(Government of Quebec 2006), and then following public hearings, the Quebec government passed a law (Bill 33, entitled An Act to amend the Act respecting health services and social services and other legislative provisions) allowing residents of Quebec to purchase private health insurance to obtain certain types of care at "a specialized medical centre where only physicians not participating in the health insurance plan practise." Insurance contracts for these operations would have to include coverage for necessary preoperative, post-operative and rehabilitation care, and the operations themselves are currently limited to hip and knee replacements as well as cataract removal. Controversially, this short list of surgeries could be expanded by regulation (i.e., without the approval of the full Quebec legislative assembly). Whether insurers offer products only for joint replacements and/or cataract surgery remains to be seen. Despite the Supreme Court's application of the Chaoulli decision to Quebec only, the Alberta government announced early in 2006 that it too planned to introduce a system of private health insurance. The government's proposal proved highly controversial, however, and several months later the Alberta health minister announced that the government had decided that it was "not prepared to proceed with private insurance at this time" (CBC News 2006). Partly in response to the Chaoulli decision, the Canadian Medical Association (CMA) also prepared a thoughtful and thoroughly researched report (CMA Task Force on the Public-Private Interface 2006). Canadian physicians have long been divided on the issue of private funding for medically necessary services, and the CMA's report is unlikely to unify the profession. Some physician leaders have expressed support for an increased role for private health insurance in Canada (Ouellet 2005), while others have recommended a recommitment to the principles of single-tier healthcare (Bhatia and Natsheh 2005; Hoyt 2005). In its report, the CMA presented four scenarios for how healthcare funding and delivery could be organized in Canada, each with a different mix of public and private elements. The CMA did not, however, present a scenario that would be in keeping with the recommendations of the National Forum on Health (1997), the Romanow Commission (Romanow 2002) and the Kirby Commission (Kirby 2002) - increased public funding coupled with enhanced public drug coverage and home care. Those on all sides of this debate often cite healthcare systems in other countries, using anecdotal examples to buttress their own arguments (Coffey 2005, April 16; Day 2005, September 13; Ouellet 2005). Many Canadians, including healthcare providers and policy makers, may be unfamiliar with the specific types of private health insurance available outside North America. In this article, I provide a general overview of the various forms of private health insurance available internationally and review a specific example of each, with a focus on three economically advanced countries. I then conclude with a consideration of private health insurance in the Canadian context, with specific recommendations for policy makers. The purpose of health insurance is to protect individuals from the potentially catastrophic financial consequences associated with medical care (Glied 2001). Insurance can be publicly funded through income taxes or payroll deductions, or privately funded through personal or employer contributions that are not directly linked to an individual's income level. In the absence of insurance, the only alternatives are out-of-pocket payments, charity or avoidance of medical care. Although there are a variety of reasons why both publicly and privately funded healthcare systems are inherently inefficient, the problem of "adverse selection" occurs only in private health insurance markets (Feldman et al. 1998; Reinhardt 2001). Adverse selection occurs when the patient has better information about his or her health risks than the insurer. For example, a middle-aged man who develops increasingly severe morning headaches may not report them when seeking to purchase insurance. His insurer may therefore rate his risk as average when, in fact, his risk of a brain tumour is considerably higher than average. To combat this problem, insurers can raise premiums, but this manoeuvre renders their policies less attractive to low-risk individuals. If healthy individuals consequently refrain from purchasing insurance because they perceive the premiums to be too expensive, an "adverse selection death spiral" can result, with higher-risk individuals being successively priced out of an insurance market (Taylor 2002). The negative effect of adverse selection can be mitigated with governmental regulation in a private health insurance market, but it is entirely eliminated with universal public health insurance. Nevertheless, most countries, including Canada, continue to permit private health insurance in some form. There are three major roles that private health insurance can play within the context of a public health insurance program. First, private health insurance can be used as a source for primary coverage, to fund healthcare for individuals who are ineligible for public health insurance (e.g., new immigrants) or those who choose not to obtain public health insurance, if opting out of the public health insurance plan is permitted, or where public health insurance is unavailable. Second, private health insurance can be used as duplicatecoverage, to cover healthcare needs that are already provided for by public funds. This is the case, for example, in the United Kingdom, Australia, New Zealand and Ireland, where individuals with private health insurance can bypass public sector waiting lists and obtain care privately. This form of private health insurance is often referred to as double coverage. Third, private health insurance can serve a supplementary role, either to cover care that is unavailable in the public sector (e.g., as with pharmaceuticals and dental care for many Canadians) or to cover the cost of fees associated with obtaining services within the public sector (e.g., as with co-payments in France). 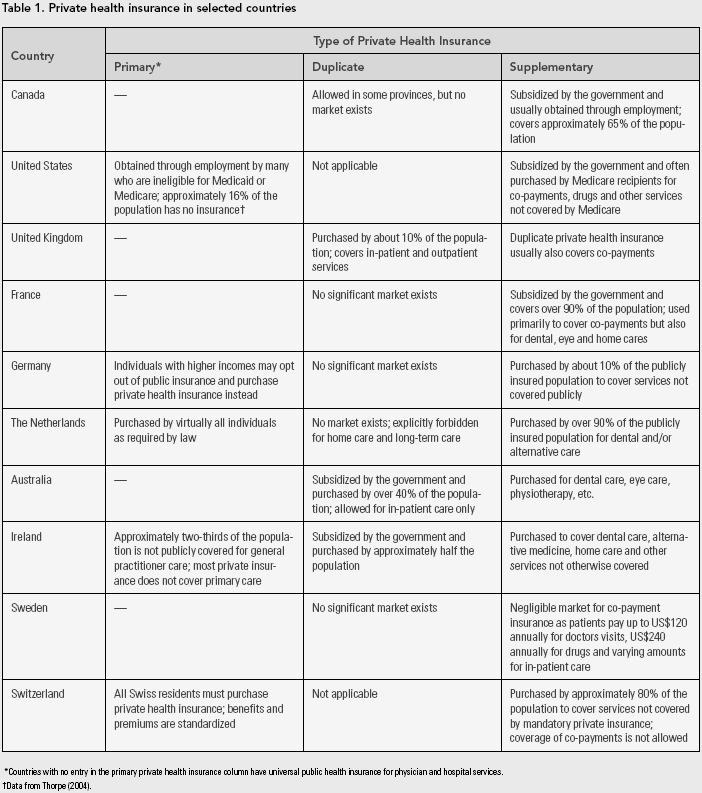 Table 1 illustrates the various forms of health insurance and their availability in select countries (Organisation for Economic Co-operation and Development [OECD] 2004). Primary private health insurance is dominant in the United States and also plays a significant - albeit very different - role in the Netherlands and Germany. Primary private health insurance plays a much smaller role in other economically advanced countries, such as Belgium, Austria and Spain. The Dutch example is presented in detail below. Since January 1, 2006, all Dutch adults have been required by law to purchase private health insurance (children receive insurance for free). The obligatory insurance covers a basket of services delineated by a quasi-governmental agency - virtually all outpatient and in-patient medical care, most drugs and other medical products (e.g., hearing aids), certain paramedical services (e.g., dietary counselling) as well as dental care for children. Insurers must accept all who apply, and cannot price insurance policies based on age, gender, health, socio-economic status or any other factor that might determine health need. Government subsidies to insurers are dependent on the insured population's average risk. Insurers can and do offer supplementary insurance for other services (e.g., eye care), and compete for customers largely on this basis. Insurers also compete by offering discounts to large group purchasers. Because virtually all health services are delivered within the public or non-profit sectors, and because hospital and physician reimbursement rates are uniform across the various health insurance schemes, private insurance does not confer preferential access to healthcare in the Netherlands (OECD 2004). Moreover, despite increasing wait times, there does not appear to be widespread public demand for a private health insurance scheme that would offer preferential access (Schut and Van de Ven 2005). The main function of duplicate private health insurance is to provide individuals with alternative coverage for services already available in the public sector. Individuals purchase duplicate private health insurance because they want higher-quality or faster care than is available with public health insurance. Duplicate health insurance is widely available in the United Kingdom, Portugal, Ireland, Australia and New Zealand. The Australian example is presented below. Public health insurance in Australia covers all charges associated with medically necessary hospitalizations and 85% of physician fees in the ambulatory setting. Pharmaceuticals, home care and long-term care are also partially covered. Private health insurance in Australia can be purchased by anyone and performs both duplicate and supplementary functions (Colombo and Tapay 2003). As of September 2005, 43% of the population was covered by private health insurance (Australian Government, Private Health Insurance Administration Council 2005). Individuals with private health insurance may opt to receive expedited elective in-patient care in private hospitals. They may also choose to be treated as private patients when admitted to a public hospital for an emergency or for a major operation not offered in the private sector. Australians cannot use private health insurance for ambulatory care (e.g., to obtain preferential access to a family physician or for an outpatient consultation with a specialist). In theory, Australians also cannot use private health insurance to bypass waiting lists for public hospital admissions (e.g., for surgeries that are unavailable in private hospitals). In practice, however, a variety of incentives encourage queue-jumping, the extent of which is unknown (Colombo and Tapay 2003). In an effort to relieve an overburdened public healthcare system, as well as to support private insurers and hospitals, the Australian government enacted regulations in the 1990s designed to promote the purchase of private health insurance. For example, high-income individuals who do not purchase private health insurance are now penalized with an extra 1% income surtax. The government also refunds a significant proportion of private health insurance premiums and pays for part of the care provided at private hospitals. Adding to the complexity is that the largest private insurer, Medibank Private Limited, is owned by the government. Australian physicians may charge fees in excess of the government tariff for hospitalized private patients and for all outpatients. For in-patients, the gap between the physician's fee and the rate set by the government can be paid by private health insurance. Because private health insurance cannot be used for ambulatory care, outpatient fees in excess of the government rate must be paid for out of pocket. The impact of private health insurance on important health policy objectives such as cost containment and improved quality and access to care has been difficult to determine. For example, one study showed that angioplasty rates after myocardial infarction were three times higher in private hospitals than in public hospitals (Robertson and Richardson 2000), but whether this is due to overutilization in the private sector, underutilization in the public sector or differing risk profiles is unclear. The "free rider" effect of private health insurance, where neither patient nor physician is exposed to the full cost of treatment, may contribute to unnecessarily long hospital admissions (Savage and Wright 2003). This can be a problem with public insurance as well, although hospitals usually have some incentive to minimize admission length. The effect of private health insurance on public sector waiting lists in Australia has been unclear (Hanning 2002; Hopkins and Frech 2001; Hurley et al. 2002). With few strategies for cost containment in the private sector and extensive subsidization, government health expenditures do not appear to have been reduced by increasing private health insurance coverage. In fact, total health expenditures have risen faster in Australia than in most other economically advanced countries (OECD 2005). The term supplementary private health insurance is used here to refer to any private health insurance scheme that covers costs not reimbursed by public insurance. Supplementary insurance can provide coverage for discretionary services, such as semi-private hospital rooms or massage therapy, or for services that should arguably be publicly insured because they are medically necessary and associated with significant expense, such as pharmaceuticals and dental care. Private health insurance that is used to cover co-payments or user fees is often referred to as complementary private health insurance. In the framework presented here, complementary private health insurance is simply one type of supplementary private health insurance. Supplementary private health insurance is available in every economically advanced country. The French example is presented here to demonstrate some of its features. Supplementary private health insurance in France is subsidized by the government, is provided mostly by non-profit providers and covers over 90% of the population (Buchmueller and Couffinhal 2004). Unlike in Australia, private insurance in France is not used to explicitly obtain preferential access to hospital care but, rather, to limit the financial risk associated with co-payments, which can be substantial in the French system. Nevertheless, because these co-payments can present a significant barrier and the lack of health insurance is strongly associated with low socioeconomic status, access to healthcare is inequitable. For example, in one study that controlled for most characteristics associated with increased healthcare utilization, adults with supplementary private health insurance were 80% more likely to see a physician within a given one-month period than individuals without private health insurance (Buchmueller et al. 2004). Other studies have also found that individuals without private health insurance were less likely to obtain care (Dourgnon and Sermet 2002; Raynaud 2003). Gatekeeping is non-existent in France; individuals can self-refer to specialists (Rodwin and Le Pen 2004). The combination of this feature of the French healthcare system, extensive government subsidization of private health insurance and the free rider effect introduced by supplemental private health insurance with its elimination of co-payments results in a situation where costs are extremely difficult to control. Per capita total healthcare expenditures in France are considerably higher than the European average and, as a proportion of gross domestic product, are also higher than Canadian expenditures (OECD 2005). In large part because universal public health insurance is limited to physician and hospital services, private health insurance for pharmaceuticals, dental care and eye care is widespread in Canada. Consequently, the prevalent impression that a greater proportion of healthcare in Canada is funded through the tax base than in most other economically advanced countries is false (OECD 2005). In 2000, the latest year for which data are available, supplementary private health insurance accounted for 11% of total health expenditures in Canada. Although this is significantly less than in the United States, the figure is comparable to European countries where private health insurance often plays a primary role (e.g., the Netherlands and Germany) and significantly higher than in countries where private health insurance sometimes plays a duplicate role (e.g., Ireland, Australia and the United Kingdom) (OECD 2004). Including out-of-pocket expenses, private payments account for 30% of the total health expenditure in Canada, a figure that is appreciably higher than in most European countries (OECD 2005). Private health insurance plays a unique role in each economically advanced country. Differences are related to the collective values of the nation's citizens as well as the incremental manner by which most economically advanced countries have achieved universal coverage. For example, Aneurin Bevan, the architect of the United Kingdom's National Health Service, only reluctantly and as a belated compromise allowed physicians to retain a second private tier (Pollock 2004). Although private health insurance is ubiquitous, its forms and penetrance vary tremendously. In some countries, like the Netherlands, citizens purchase private health insurance that functions in a similar manner to the tax-funded public health insurance provided to citizens of other countries. Private health insurance in these countries generally confers no special access to care. Other countries, like Sweden, permit private health insurance but have not witnessed the development of a robust private insurance market because of stringent government regulations. Finally, a small number of countries have significant markets for duplicate private health insurance, which allows wealthier individuals to access care preferentially. The present debate in Canada is not about private health insurance in general because supplementary private health insurance is already widespread. The controversy (and Chaoulli v. Québec) concerns duplicate insurance and its implications for preferential access to care for more affluent members of society. Multiple national consultations have revealed that most Canadians feel that providing wealthier individuals with better or faster care is discordant with their values (Kirby 2002; National Forum on Health 1997; Romanow 2002). Federal and provincial governments should consider these views, in conjunction with the experiences of other economically advanced countries, when deciding how to regulate private health insurance in Canada. Where there is no public insurance, private health insurance obviously improves access to care. For example, Canadians with employer-sponsored health insurance plans have better access to medically necessary drugs than Canadians who are ineligible for public drug plans and who do not have private insurance. Provincial premiers in Canada have agreed that Canadians should have affordable access to drugs and have directed their health ministers to develop a National Pharmaceuticals Strategy (NPS). Although a progress report has been delivered (Federal/Provincial/Territorial Ministerial Task Force 2006), the full strategy remains to be developed. Compared with other OECD countries, a larger proportion of pharmaceutical expenditures in Canada is financed privately, either out of pocket or through private insurance. Canadian policy makers need to urgently accelerate the development of a comprehensive NPS. Ideally, our reliance on private health insurance for pharmaceutical coverage should be reduced so that all Canadians have access to medically necessary drugs. If remuneration for services is greater in the private sector than in the public sector, healthcare providers may be preferentially attracted to the private sector and have an incentive to keep their public sector waiting lists long so that patients may be shifted from the public sector to the private sector when the wait-time guarantee expires. If complications experienced by private patients are managed in public hospitals, the resources available for elective operations such as joint replacements in public sector hospitals may decrease. The supply of physicians, nurses and other healthcare professionals in Canada is not easily increased; if the health human resource shortage in public sector hospitals is exacerbated by the growth of private clinics, then public waiting lists may lengthen. Healthcare providers must continue to be appropriately attracted to public practice. For example, remuneration in the private sector should be no greater than in the public sector, and where it is offered on a per-procedure basis, it should be adjusted for risk and complexity so that public hospitals are not asked to manage the difficult cases for the same fee that private clinics receive to manage more simple cases. If physicians are permitted to practise in both sectors, they must have incentives to keep their public sector waiting lists as short as possible. Alternatively, waiting lists should be centralized so that they can be managed more optimally. Private clinics should be held responsible for all costs associated with complications that are managed in public sector hospitals. Because private insurers have increased costs compared with public insurers (e.g., because of marketing and administration) (Woolhandler et al. 2003), it remains to be seen whether private surgical clinics can provide high quality care underconstraints such as those described above. Evidence from other fields of healthcare (e.g., nursing homes, hospital care and dialysis clinics) suggests that this may be unlikely (Devereaux et al. 2002a, 2002b; Hillmer et al. 2005). Irfan Dhalla, MD, FRCPC, is with the Department of Medicine, University of Toronto and with Canadian Doctors for Medicare. He can be reached at: irfan.dhalla@utoronto.ca. I am grateful to Dave Juurlink, Gordon Guyatt, Tara Kiran, Joël Ménard, Ahmed Bayoumi, Jerry Hurley, Steve Shumak, David Naylor, Simon Turcotte and Steven Barrett for thoughtfully commenting on earlier versions of this manuscript. Australian Government, Private Health Insurance Administration Council. 2005. Industry Statistics. Canberra: Australian Government. Retrieved August 24, 2007. < http://www.phiac.gov.au/statistics/ membershipcoverage/hosquar.htm >. Bhatia, S. and A. Natsheh. 2005. "Should Canadian Physicians Support Parallel Private Health Care?" Canadian Medical Association Journal 173(8): 901-2. Bourdeau, S. 2006. "After Chaoulli ... Bill 33 Opens the Door to Private Clinics and Private Insurance in Québec." Fasken Martineau Health Law Bulletin. June: 1-6. Buchmueller, T.C. and A. Couffinhal. 2004. Private Health Insurance in France. Paris: Organisation for Economic Co-operation and Development. Buchmueller, T.C., A. Couffinhal, M. Grignon and M. Perronnin. 2004. "Access to Physician Services: Does Supplemental Insurance Matter? Evidence from France." Health Economics 13(7): 669-87. Canadian Medical Association Task Force on the Public-Private Interface. 2006. It's About Access! Informing the Debate on Public and Private Health Care. Ottawa: Canadian Medical Association. CBC News. 2006. Alberta Backs Away from 'Third Way' Health Reforms. Toronto: Author. Retrieved August 24, 2007. < http://www.cbc.ca/story/canada/national /2006/04/20/thirdway060420.html >. Chaoulli v. Québec (Attorney General). 2005. S.C.C. 35. Coffey, E. 2005, April 26. "OPED: Infringed Upon." The Medical Post. Retrieved November 23, 2005. < http://www.medicalpost.com/mpcontent/ article.jsp?content=20050425_162753_5108 >. Colombo, F. and N. Tapay. 2003. Private Health Insurance in Australia: A Case Study. Paris: Organisation for Economic Co-operation and Development. Day, B. 2005, September 13. "OPED: The Grass Is Greener." The Medical Post. Retrieved November 23, 2005. < http://www.medicalpost.com/mpcontent/ article.jsp?content=20050913_191836_4944 >. Deber, R.B. 2003. "Health Care Reform: Lessons from Canada." American Journal of Public Health 93(1): 20-24. Detsky, A.S. and C.D. Naylor. 2003. "Canada's Health Care System - Reform Delayed." New England Journal of Medicine 349(8): 804-10. Devereaux, P.J., H.J. Schünemann, N. Ravindran, M. Bhandari, A.X. Garg, P.T. Choi, B.J. Grant, T. Haines, C. Lacchetti, B. Weaver, J.N. Lavis, D.J. Cook, D.R. Haslam, T. Sullivan and G.H. Guyatt. 2002a. "Comparison of Mortality between Private For-Profit and Private Not-for-Profit Hemodialysis Centers: A Systematic Review and Meta-analysis." Journal of the American Medical Association 288(19): 2449-57. Devereaux, P.J., P.T. Choi, C. Lacchetti, B. Weaver, H.J. Schünemann, T. Haines, J.N. Lavis, B.J. Grant, D.R. Haslam, M. Bhandari, T. Sullivan, D.J. Cook, S.D. Walter, M. Meade, H. Khan, N. Bhatnagar and G.H. Guyatt. 2002b. "A Systematic Review and Meta-analysis of Studies Comparing Mortality Rates of Private For-Profit and Private Not-for-Profit Hospitals." Canadian Medical Association Journal 166(11): 1399-406. Dickens, B. 2005. "The Chaoulli Judgment: Less Than Meets the Eye - Or More." In C.M. Flood, K. Roach and L. Sossin, eds., Access to Care, Access to Justice: The Legal Debate Over Private Health Insurance in Canada. Toronto: University of Toronto Press. Dourgnon, P. and C. Sermet. 2002. La consommation de médicaments varie-t-elle selon l'assurance complémentaire? Paris: Centre de Recherche d'Etudes et de Documentation en Economie de la Santé. Feldman, R., C. Escribano and L. Pellise. 1998. "The Role of Government in Health Insurance Markets with Adverse Selection." Health Economics 7(8): 659-70. Flood, C.M. and T. Archibald. 2001. "The Illegality of Private Health Care in Canada." Canadian Medical Association Journal 164(6): 825-30. Glied, S.A. 2001. "Health Insurance and Market Failure since Arrow." Journal of Health Politics, Policy and Law 26(5): 957-65. Government of Quebec. 2006. Guaranteeing Access: Meeting the Challenges of Equity, Efficiency and Quality. Quebec City: Author. Hanning B. 2002. "Has the Increase in Private Health Insurance Uptake Affected the Victorian Public Hospital Surgical Waiting List?" Australian Health Review 25(6): 64-71. Hillmer, M.P., W.P. Wodchis, S.S. Gill, G.M. Anderson and P.A. Rochon. 2005. "Nursing Home Profit Status and Quality of Care: Is There Any Evidence of an Association?" Medical Care Research and Review 62(2): 139-66. Hopkins, S. and H.E. Frech. 2001. "The Rise of Private Health Insurance in Australia: Early Effects on Insurance and Hospital Markets." Economics and Labour Relations Review 12(2): 225-38. Hoyt, B. 2005. "Public versus Private: The Medical Resident Perspective." Canadian Medical Association Journal 173(8): 898-99. Hurley, J., R. Vaithianathan, T.F. Crossley and D. Cobb-Clark. 2002. Parallel Private Health Insurance in Australia: A Cautionary Tale and Lessons for Canada [Discussion Paper No. 448]. London: Centre for Economic Policy Research. Kirby, M.J. 2002. The Health of Canadians - The Federal Role. Volume Six: Recommendations for Reform. Ottawa: The Standing Senate Committee on Social Affairs, Science and Technology. National Forum on Health. 1997. Canada Health Action: Building on the Legacy. Ottawa: Government of Canada. Naylor, C.D. 1999. "Health Care in Canada: Incrementalism under Fiscal Duress." Health Affairs (Millwood) 18(3): 9-26. Organisation for Economic Co-operation and Development. 2004. Private Health Insurance in OECD Countries. Paris: Author. Organisation for Economic Co-operation and Development. 2005. OECD Health Data 2005: Statistics and Indicators for 30 Countries. Paris: Author. Ouellet, R. 2005. "The Chaoulli Decision: A Debate in Which Physicians Must Be Heard." Canadian Medical Association Journal 173(8): 896. Pollock, A.M. 2004. NHS plc : The Privatization of Our Health Care. London: Verso. Raynaud, D. 2003. "L'impact de la CMU sur la consommation individuelle de soins." Études et Résultats 229: 1-8. Reinhardt, U.E. 2001. "Can Efficiency in Health Care Be Left to the Market?" Journal of Health Politics, Policy and Law 26(5): 967-92. Robertson, I.K. and J.R. Richardson. 2000. "Coronary Angiography and Coronary Artery Revascularisation Rates in Public and Private Hospital Patients after Acute Myocardial Infarction." Medical Journal of Australia 173(6): 291-95. Rodwin, V.G. and C. Le Pen. 2004. "Health Care Reform in France - The Birth of State-Led Managed Care." New England Journal of Medicine 351(22): 2259-62. Romanow, R.J. 2002. Building on Values: The Future of Health Care in Canada - Final Report. Saskatoon: Commission on the Future of Health Care in Canada. Savage, E. and D.J. Wright. 2003. "Moral Hazard and Adverse Selection in Australian Private Hospitals: 1989-1990." Journal of Health Economics 22(3): 331-59. Schut, F.T. and W.P. Van de Ven. 2005. "Rationing and Competition in the Dutch Health-Care System." Health Economics 14(Suppl. 1): S59-S74. Tapay, N. and F. Colombo. 2004. Private Health Insurance in the Netherlands: A Case Study. Paris: Organisation for Economic Co-operation and Development. Taylor, H. 2002. "How and Why the Health Insurance System Will Collapse." Health Affairs (Millwood) 21(6): 195-97. Thorpe, K.E. 2004. "Protecting the Uninsured." New England Journal of Medicine 351(15): 1479-81. Tuohy, C.H., C.M. Flood and M. Stabile. 2004. "How Does Private Finance Affect Public Health Care Systems? Marshaling the Evidence from OECD Nations." Journal of Health Politics, Policy and Law 29(3): 359-96. Woolhandler, S., T. Campbell and D.U. Himmelstein. 2003. "Costs of Health Care Administration in the United States and Canada." New England Journal of Medicine 349(8): 768-75.